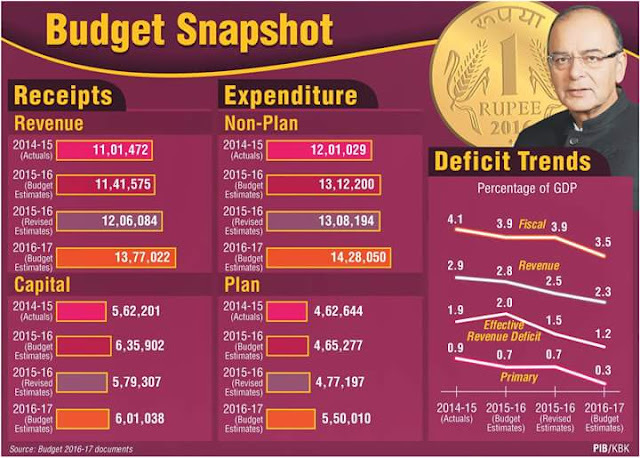 Arun Jaitely, Union Finance Minister presented the Annual Financial Statement- 'Budget' 2016-17 in Lok Sabha on 29th February, 2016. The main focus was on Agriculture and Rural sector to spur the demands and targeted to double the farmers income by 2022. He cited that he was presenting the Budget amid of global turmoil growing with 3.1% in 2015. The Current Account deficit has declined from 18.4 billion US dollars in the first half of last year to 14.4 billion this year. It is projected to be 1.4% of GDP at the end of this year. The foreign exchange reserves are at the highest ever level of about 350 billion US dollars. In each of these themes, he outlined specific policy measures and initiatives which would have a transformative impact on Indian economy and the lives of people. According to Budget 2016-17, the Fiscal Deficit target of 3.9% has been achieved without reduction in expenditure outlay at RE stage. The total plan outlay for 2016-17 is Rs.5,50,010 crore and Non- Plan outlay is Rs.,28,050.45 crore. A range of fiscal deficit 2018 onward has been proposed instead targeted fiscal deficit which is set at 3.5% for 2016-17. Allocation for Agriculture and Farmers’ welfare is Rs.35,984 crore. It has been targeted to double farmers incomes by 2022. Implementation of 89 irrigation projects under AIBP, which are languishing for a long time, will be fast tracked. A dedicated Long Term Irrigation Fund will be created in NABARD with an initial corpus of about ` 20,000 crore. Programme for sustainable management of ground water resources with an estimated cost of Rs.6,000 crore will be implemented through multilateral funding. 5 lakh farm ponds and dug wells in rain fed areas and 10 lakh compost pits for production of organic manure will be taken up under MGNREGA. 2,000 model retail outlets of Fertilizer companies will be provided with soil and seed testing facilities during the next three years. Unified Agricultural Marketing ePlatform to provide a common e-market platform for wholesale markets. It will be launched on 14th April 2016- B.R.Ambedkar's anniversay. Government also seeks to amend states APMC act to provide single market to farmers. To reduce the burden of loan repayment on farmers, a provision of Rs.15,000 crore has been made in the BE 2016-17 towards interest subvention. Allocation under Prime Minister Fasal Bima Yojana -Rs.5,500 crore. Allocation for rural sector - Rs.87,765 crore. Rs.2.87 lakh crore will be given as Grant in Aid to Gram Panchayats and Municipalities as per the recommendations of the 14th Finance Commission. It translates an average of Rs.80 lakhs and Rs.21 crores to each gram panchayats and municipalities council respectively. Every block under drought and rural distress will be taken up as an intensive Block under the Deen Dayal Antyodaya Mission. It has been allocated Rs.3000 crore, whereas Rs.5500 crore has been allocated to Integrated Power Development Scheme. A sum of ` Rs.38,500 crore allocated for MGNREGS with guaranteed 100 days of employment. 300 Rurban Clusters will be developed under the Shyama Prasad Mukherjee Rurban Mission. District Level Committees under Chairmanship of senior most Lok Sabha MP from the district for monitoring and implementation of designated Central Sector (100% centrally sponsored) and Centrally Sponsored Schemes(60:40 for states and 90:10 for North-eastern states). Priority allocation from Centrally Sponsored Schemes to be made to reward villages that have become free from open defecation. 5000 crore rupees and 9000 crore rupees have allocated to provide safe drinking water in rural areas and for Swachh Bharat Abhiyan for rural sanitation respectively. New scheme Rashtriya Gram Swaraj Abhiyan proposed with allocation of Rs.655 crore. Rs.9000 crore has been allocated for Swachh Bharat Abhiyan. New health protection scheme will provide health cover up to Rs.1 lakh per family. For senior citizens an additional top-up package up to Rs.30,000 will be provided. ‘National Dialysis Services Programme’ to be started under National Health Mission through PPP mode. The equipment of dialysis machine will be exempted from custom duties/CVD and SAD. National Scheduled Caste and Scheduled Tribe Hub to be set up in partnership with industry associations to encourage SC/ST and women entrepreneurs. Rs.500 crore has been allocated for it and there will be 100% deduction of profits for three years. Allocation of Rs.100 crore each for celebrating the Birth Centenary of Pandit Deen Dayal Upadhyay and the 350th Birth Anniversary of Guru Gobind Singh. Rs.2791 crore for Post-Matric scholarship for Scheduled Castes. Rs.885 crore for Post-Matric scholarship for Other Backward Classes. Rs.130 crore for Aids and Appliances for Handicapped. Rs.193 crore for Sugamya Bharat Abhiyan. Rs.113 crore for various National Institutes for Disabled Persons. Rs.19000 crore for National Health Mission. Rs.2450 crore for Pradhan Mantri Swasthya Suraksha Yojana. Rs.1500 crore for Rashtriya Swasthya Suraksha Yojana. Rs.22500 crore for Sarva Shiksha Abhiyan to increasing focus on quality education. 62 new Navodaya Vidyalayas will be opened. Higher Education Financing Agency to be set-up with initial capital base of Rs.1000 crores. Rs.9700 crore for National Programme of Mid Day Meals in Schools. Rs.3700 crore for Rashtriya Madhyamik Shiksha Abhiyan. Rs.5755 crore for Technical Education. Rs.2050 crore for University Grants Commission. Rs.1300 crore for Rashtriya Uchchtar Shiksha Abhiyan. Digital Depository for School Leaving Certificates, College Degrees, Academic Awards and Mark sheets to be set-up. It will help the students to safely place their documents online without being misplaced or lost. Allocation for skill development – Rs.1804 crore. Entrepreneurship Education and Training through Massive Open Online Courses. GoI will pay contribution of 8.33% for of all new employees enrolling in EPFO for the first three years of their employment with salary 15000/month or less. Budget provision of Rs.1000 crore for this scheme. Total outlay for infrastructure - Rs.2,21,246 crore. To provide calibrated marketing freedom in order to incentivise gas production from deep-water, ultra deep-water and high pressure-high temperature areas. A new policy for management of Government investment in Public Sector Enterprises, including disinvestment and strategic sale approved. The government also proposed to amend RBI act, 1934 for setting up of a Monetary Policy Committee through Financial Bill 2016. It will set the benchmark interest rate of the central bank and set inflation targets. Allocation of Rs.25,000 crore towards recapitalisation of Public Sector Banks. Aadhar will get legal backing from the government. It will be necessary to have Aadhar card to get subsidy or any other benefits from the government funds. A Task Force has been constituted for rationalising of human resources in various Ministries. Introduce DBT on pilot basis for fertilizer in a few districts across the country, with a view to improving the quality of service delivery to farmers. Amendments in Companies Act, 2013 to improve enabling environment for start-ups. Comments "Pivotal details of Union Budget 2016-17"